ZOMIG should only be used where a clear diagnosis of migraine has been established. If a patient has no response for the first migraine attack treated with ZOMIG, the diagnosis of migraine should be reconsidered before ZOMIG is administered to treat any subsequent attacks. ZOMIG is not intended for the prophylactic therapy of migraine or for use in the management of hemiplegic or basilar migraine [see Contraindications (4.6)]. Safety and effectiveness of ZOMIG have not been established for cluster headache, which is present in an older, predominantly male population. Administer one dose of ZOMIG Nasal Spray 5 mg for the treatment of acute migraine. If the headache returns, the dose may be repeated after 2 hours. The effectiveness of a second dose has not been established in placebo-controlled trials. The maximum daily dose should not exceed 10 mg in any 24-hour period. Individuals may vary in response to ZOMIG Nasal Spray. 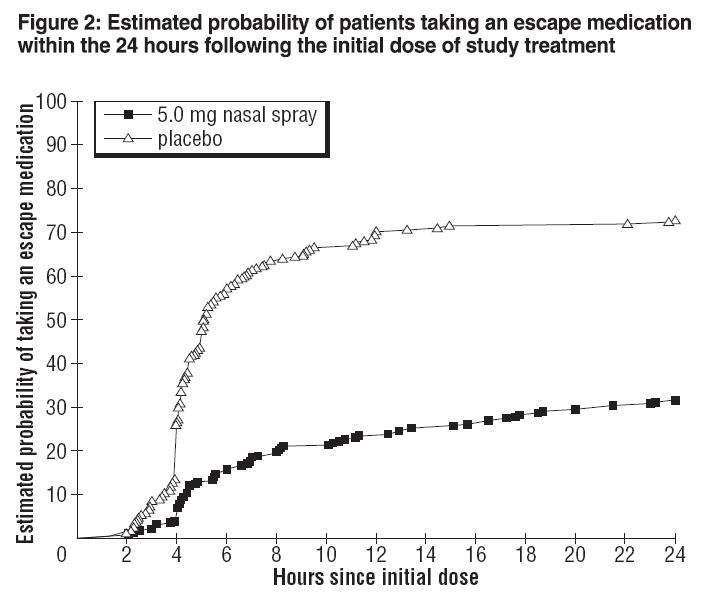 The pharmacokinetics of a 5 mg nasal spray dose is similar to the 5 mg oral formulations. Doses lower than 5 mg can only be achieved through the use of an oral formulation. The choice of dose, and route of administration should therefore be made on an individual basis. Patients with moderate to severe hepatic impairment have decreased clearance of zolmitriptan and significant elevation in blood pressure was observed in some patients. Use of doses less than 2.5mg of an alternate formulation with blood pressure monitoring is recommended [see Clinical Pharmacology (12.3) and Warnings and Precautions (5.6)]. ZOMIG should not be given to patients with ischemic heart disease (angina pectoris, history of myocardial infarction, or documented silent ischemia) or to patients who have symptoms or findings consistent with ischemic heart disease, coronary artery vasospasm, including Prinzmetalâ€™s variant angina, or other significant underlying cardiovascular disease [see Warnings and Precautions (5.1)]. ZOMIG should not be given to patients with cerebrovascular syndromes including (but not limited to) stroke of any type as well as transient ischemic attacks. [see Warnings and Precautions (5.3)]. ZOMIG should not be given to patients with peripheral vascular disease including (but not limited to) ischemic bowel disease [see Warnings and Precautions (5.4)]. Because ZOMIG may increase blood pressure, it should not be given to patients with uncontrolled hypertension [see Warnings and Precautions (5.6)]. ZOMIG and any ergotamine-containing or ergot-type medication (such as dihydroergotamine or methysergide) should not be used within 24 hours of each other, nor should ZOMIG and another 5-HT1 agonist be used within 24 hours of each other [See Drug Interactions (7.1 and 7.3)]. Concurrent administration of MAO-A inhibitors or use of zolmitriptan within 2 weeks of discontinuation of MAO-A inhibitor therapy is contraindicated [see Clinical Pharmacology (12.4) and Drug Interactions (7.2)]. ZOMIG can cause coronary artery vasospasm; at least one of these events occurred in a patient with no cardiac disease history and with documented absence of coronary artery disease. Because of the close proximity of the events to ZOMIG use, a causal relationship cannot be excluded. In the cases where there has been known underlying coronary artery disease, the relationship is uncertain. Patients who experience signs or symptoms suggestive of angina following dosing should be evaluated for the presence of CAD or a predisposition to Prinzmetalâ€™s variant angina before receiving additional doses of medication, and should be monitored electrocardiographically if dosing is resumed and similar symptoms recur. Among the more than 2,500 patients with migraine who participated in premarketing controlled clinical trials of ZOMIG Tablets, no deaths or serious cardiac events were reported. In a premarketing controlled clinical trial of ZOMIG Nasal Spray, more than 1,300 patients participated and there were no deaths or serious cardiac events to report. Because of the potential of this class of compound (5-HT1 agonists) to cause coronary vasospasm, ZOMIG should not be given to patients with documented ischemic or vasospastic coronary artery disease [see Contraindications (4.1)]. It is strongly recommended that zolmitriptan not be given to patients in whom unrecognized coronary artery disease (CAD) is predicted by the presence of risk factors (eg, hypertension, hypercholesterolemia, smoker, obesity, diabetes, strong family history of CAD, female with surgical or physiological menopause, or male over 40 years of age) unless a cardiovascular evaluation provides satisfactory clinical evidence that the patient is reasonably free of coronary artery and ischemic myocardial disease or other significant underlying cardiovascular disease. The sensitivity of cardiac diagnostic procedures to detect cardiovascular disease or predisposition to coronary artery vasospasm is modest, at best. If, during the cardiovascular evaluation, the patientâ€™s medical history, electrocardiographic or other investigations reveal findings indicative of, or consistent with, coronary artery vasospasm or myocardial ischemia, zolmitriptan should not be administered [see Contraindications (4.1)]. For patients with risk factors predictive of CAD, who are determined to have a satisfactory cardiovascular evaluation, it is strongly recommended that administration of the first dose of zolmitriptan take place in the setting of a physicianâ€™s office or similar medically staffed and equipped facility unless the patient has previously received zolmitriptan. Because cardiac ischemia can occur in the absence of clinical symptoms, consideration should be given to obtaining on the first occasion of use an electrocardiogram (ECG) during the interval immediately following ZOMIG, in these patients with risk factors. As with other 5-HT1 agonists, sensations of tightness, pain, pressure, and heaviness in the precordium, throat, neck, and jaw have been reported after treatment with ZOMIG Tablets. Because 5-HT1 agonists may cause coronary vasospasm, patients who experience signs or symptoms suggestive of angina following dosing should be evaluated for the presence of CAD or a predisposition to Prinzmetalâ€™s variant angina before receiving additional doses of medication, and should be monitored electrocardiographically if dosing is resumed and similar symptoms occur. Patients shown to have CAD and those with Prinzmetalâ€™s variant angina should not receive 5-HT1 agonists [see Contraindications (4.1)]. Cerebral hemorrhage, subarachnoid hemorrhage, stroke, and other cerebrovascular events have been reported in patients treated with 5-HT1 agonists, and some have resulted in fatalities. In a number of cases, it appears possible that the cerebrovascular events were primary, the agonist having been administered in the incorrect belief that the symptoms experienced were a consequence of migraine, when they were not. As with other acute migraine therapies, before treating headaches in patients not previously diagnosed as migraineurs, and in migraineurs who present with atypical symptoms, care should be taken to exclude other potentially serious neurological conditions. It should be noted that patients with migraine may be at increased risk of certain cerebrovascular events (eg, stroke, hemorrhage, transient ischemic attack) [see Contraindications (4.2)]. 5-HT1 agonists, including ZOMIG, may cause vasospastic reactions other than coronary artery vasospasm, such as peripheral and gastrointestinal vascular ischemia with abdominal pain and bloody diarrhea. Very rare reports of transient and permanent blindness and significant partial vision loss have been reported with the use of 5-HT1 agonists. Visual disorders may also be part of a migraine attack. Patients who experience other symptoms or signs suggestive of decreased arterial flow following the use of any 5-HT agonist, such as ischemic bowel syndrome or Raynaudâ€™s syndrome, are candidates for further evaluation [see Contraindications (4.3)]. 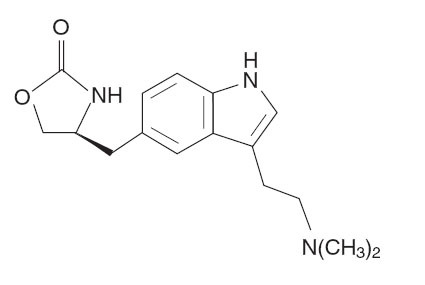 The development of a potentially life-threatening serotonin syndrome may occur with triptans, including ZOMIG treatment, particularly during combined use with selective serotonin reuptake inhibitors (SSRIs) or serotonin norepinephrine reuptake inhibitors (SNRIs). If concomitant treatment with ZOMIG and an SSRI (e.g., fluoxetine, paroxetine, sertraline, fluvoxamine, citalopram, escitalopram) or SNRI (e.g., venlafaxine, duloxetine) is clinically warranted, careful observation of the patient is advised, particularly during treatment initiation and dose increases. Serotonin syndrome symptoms may include mental status changes (e.g., agitation, hallucinations, coma), autonomic instability (e.g., tachycardia, labile blood pressure, hyperthermia), neuromuscular aberrations (e.g., hyperreflexia, incoordination) and/or gastrointestinal symptoms (e.g., nausea, vomiting, diarrhea) [See Drug Interactions (7.5)]. As with other 5-HT1 agonists, significant elevations in systemic blood pressure have been reported on rare occasions with ZOMIG Tablet use, in patients with and without a history of hypertension; very rarely these increases in blood pressure have been associated with significant clinical events. Zolmitriptan is contraindicated in patients with uncontrolled hypertension. In volunteers, an increase of 1 and 5 mm Hg in the systolic and diastolic blood pressure, respectively, was seen at 5 mg. In the headache trials, vital signs were measured only in the small inpatient study and no effect on blood pressure was seen. In a study of patients with moderate to severe liver disease, 7 of 27 experienced 20 to 80 mm Hg elevations in systolic and/or diastolic blood pressure after a dose of 10 mg of zolmitriptan [see Contraindications (4.4)]. Serious cardiac reactions, including myocardial infarction, have occurred following the use of ZOMIG Tablets. These reactions are extremely rare and most have been reported in patients with risk factors predictive of CAD. Reactions reported, in association with triptans, have included coronary artery vasospasm, transient myocardial ischemia, myocardial infarction, ventricular tachycardia, and ventricular fibrillation [see Contraindications (4.1) and Warnings and Precautions (5.1)]. Among 464 adult patients treating single attacks with zolmitriptan nasal spray in a blinded placebo controlled trial, there was a low withdrawal rate related to adverse reactions: 5 mg (1.3%), and placebo (0.4%). None of the withdrawals were due to a serious reaction. One patient was withdrawn due to abnormal ECG changes from baseline that was incidentally found 23 days after the last dose of ZOMIG Nasal Spray. The most common adverse reactions in clinical trials for ZOMIG Nasal Spray were: unusual taste, paresthesia, hyperesthesia, and dizziness. Table 1 lists the adverse reactions that occurred in â‰¥ 2% of the 236 patients in the 5 mg dose group of the controlled clinical trial. Table 1: Adverse reactions with an incidence of â‰¥ 2% of patients in the zolmitriptan 5 mg nasal spray treatment group by body system and greater than placebo. Adverse clinical reactions occurring in â‰¥ 1% and < 2% of patients in all attacks of the controlled clinical trial were pain abdominal, pressure throat, vomiting, headache, tightness chest, dysphagia, insomnia, palpitation and reaction aggravation. Among 922 patients using the zolmitriptan nasal spray to treat 2311 attacks in the controlled clinical study who were exposed, across all doses (0.5 to 5 mg), approximately 3% noted local irritation or soreness at the site of administration. Adverse reactions of any kind, perceived in the nasopharynx (which may include systemic effects of triptans) were severe in about 1% of patients and approximately 60% resolved in 1 hour. Nasopharyngeal examinations, in a subset of patients participating in two long term trials of up to one year duration, failed to demonstrate any clinically significant changes with repeated use of ZOMIG Nasal Spray. All nasopharyngeal adverse reactions with an incidence of â‰¥ 2% of patients in any zolmitriptan nasal spray dose groups are included in ADVERSE REACTIONS Table 1. The adverse experience profile seen with ZOMIG Nasal Spray is similar to that seen with ZOMIG tablets and ZOMIG-ZMT tablets except for the occurrence of local adverse reactions from the nasal spray (see ZOMIG Tablet Prescribing Information). The following section enumerates potentially important adverse reactions that have occurred in clinical practice and which have been reported spontaneously to various surveillance systems. The reactions enumerated represent reports arising from both domestic and non-domestic use of oral zolmitriptan. The reactions enumerated include all except those already listed in the ADVERSE REACTIONS section above or those too general to be informative. Because the reports cite reactions reported spontaneously from worldwide postmarketing experience, frequency of reactions and the role of zolmitriptan in their causation cannot be reliably determined. Very rare gastrointestinal ischemic reactions including splenic infarction, ischemic colitis and gastrointestinal infarction or necrosis have been reported; these may present as bloody diarrhea or abdominal pain [see Warnings and Precautions (5.4)]. Serotonin syndrome has also been reported during the postmarketing period [see Warnings and Precautions (5.5)]. Ergot-containing drugs have been reported to cause prolonged vasospastic reactions. Because there is a theoretical basis that these effects may be additive, use of ergotamine-containing or ergot-type medications (like dihydroergotamine or methysergide) and zolmitriptan within 24 hours of each other should be avoided [see Contraindications (4.5)]. MAO-A inhibitors increase the systemic exposure of zolmitriptan. Therefore, the use of zolmitriptan in patients receiving MAO-A inhibitors is contraindicated [see Clinical Pharmacology (12.4) and Contraindications (4.7)]. Concomitant use of other 5-HT1B/1D agonists within 24 hours of ZOMIG treatment is not recommended [see Contraindications (4.5)]. Following administration of cimetidine, the half-life and AUC of zolmitriptan and its active metabolites were approximately doubled [see Clinical Pharmacology (12.4)]. Cases of life-threatening serotonin syndrome have been reported during combined use of selective serotonin reuptake inhibitors (SSRIs) or serotonin norepinephrine reuptake inhibitors (SNRIs) and triptans [see Warnings and Precautions (5.5)]. Pregnancy Category C. There are no adequate and well controlled studies in pregnant women; therefore, zolmitriptan should be used during pregnancy only if the potential benefit justifies the potential risk to the fetus. In reproductive toxicity studies in rats and rabbits, oral administration of zolmitriptan to pregnant animals resulted in embryolethality and fetal abnormalities (malformations and variations) at clinically relevant exposures. When zolmitriptan was administered to pregnant rats during the period of organogenesis at oral doses of 100, 400, and 1200 mg/kg/day (plasma exposures (AUCs) â‰ˆ280, 1100, and 5000 times the human AUC at the maximum recommended human dose (MRHD) of 10 mg/day, there was a dose-related increase in embryolethality. A no-effect dose for embryolethality was not established. When zolmitriptan was administered to pregnant rabbits during the period of organogenesis at oral doses of 3, 10, and 30 mg/kg/day (plasma AUCs â‰ˆ1, 11, and 42 times the human AUC at the MRHD), there were increases in embryolethality and in fetal malformations and variations. The no-effect dose for adverse effects on embryo-fetal development was associated with a plasma AUC similar to that in humans at the MRHD. When female rats were given zolmitriptan during gestation, parturition, and lactation at oral doses of 25, 100, and 400 mg/kg/day (plasma AUCs â‰ˆ70, 280, and 1100 times that in human at the MRHD), an increased incidence of hydronephrosis was found in the offspring. The no-effect dose was associated with a plasma AUC â‰ˆ280 times that in humans at the MRHD. Safety and effectiveness of ZOMIG in pediatric patients have not been established; therefore, ZOMIG is not recommended for use in patients under 18 years of age. A single, multicenter, double-blind, randomized placebo-controlled, study was conducted to evaluate the efficacy of zolmitriptan 5 mg nasal spray in the acute treatment of migraine headache in 171 evaluable adolescent subjects 12 to 17 years of age. Efficacy was not established in that study. Adverse reactions observed in this study were similar in nature and frequency to those reported in ZOMIG Nasal Spray adult clinical trials. The most commonly reported adverse reactions (â‰¥ 2% and > placebo) were dysgeusia (7%), nasal discomfort (3%), dizziness (2%), nasal congestion (2%), nausea (2%), and throat irritation (2%). ZOMIG Nasal Spray has not been studied in pediatric patients under 12 years of age. Although the pharmacokinetic disposition of the drug in the elderly is similar to that seen in younger adults, there is no information about the safety and effectiveness of zolmitriptan in this population because patients over age 65 were excluded from the controlled clinical trials [see Clinical Pharmacology (12.3)]. The effect of hepatic disease on the pharmacokinetics of zolmitriptan nasal spray has not been evaluated. After oral administration, zolmitriptan exposure was increased in patients with severe hepatic impairment, and significant elevation in blood pressure was observed in some patients. Because of the similarity in exposure, zolmitriptan tablets and nasal spray should have similar dosage adjustments and should be administered with caution in subjects with liver disease, generally using doses less than 2.5 mg. Doses lower than 5 mg can only be achieved through the use of an oral formulation [see Dosage and Administration (2.2) and Clinical Pharmacology (12.3)]. The empirical formula is C16H21N3O2, representing a molecular weight of 287.36. Zolmitriptan is a white to almost white powder that is readily soluble in water. ZOMIG Nasal Spray is supplied as a clear to pale yellow solution of zolmitriptan, buffered to a pH 5.0. Each ZOMIG Nasal Spray contains 5 mg of zolmitriptan in a 100-Î¼L unit dose aqueous buffered solution containing citric acid, anhydrous, USP, disodium phosphate dodecahydrate USP and purified water USP. Zolmitriptan binds with high affinity to human recombinant 5-HT1D and 5-HT1B receptors. Zolmitriptan exhibits modest affinity for 5-HT1A receptors, but has no significant affinity (as measured by radioligand binding assays) or pharmacological activity at 5-HT2, 5-HT3, 5-HT4, Î±1-, Î±2- or Î²1-adrenergic; H1, H2, histaminic; muscarinic; D1, or D2 receptors. The N-desmethyl metabolite also has high affinity for 5-HT1B/1D and modest affinity for 5-HT1A receptors. Zolmitriptan nasal spray is rapidly absorbed via the nasopharynx as detected in a Photon Emission Tomography (PET) study using 11C zolmitriptan. Zolmitriptan was detected in plasma by 5 minutes and peak plasma concentration generally was achieved by 3 hours. The time at which maximum plasma concentrations were observed was similar after single (1 day) or multiple (4 day) nasal dosing. Plasma concentrations of zolmitriptan are sustained for 4 to 6 hours after dosing. Zolmitriptan displays linear kinetics after multiple doses of 2.5 mg, 5 mg, or 10 mg. The mean relative bioavailability of the nasal spray formulation is 102%, compared with the oral tablet. The effect of renal impairment on the pharmacokinetics of zolmitriptan nasal spray has not been evaluated. After orally dosing zolmitriptan, renal clearance was reduced by 25% in patients with severe renal impairment (Clcr â‰¥ 5 â‰¤ 25 mL/min) compared with the normal group (Clcr â‰¥ 70 mL/min); no significant change in renal clearance was observed in the moderately renally impaired group (Clcr â‰¥ 26 â‰¤ 50 mL/min). The effect of hepatic disease on the pharmacokinetics of zolmitriptan nasal spray has not been evaluated. In severely hepatically impaired patients, the mean Cmax, Tmax, and AUC0-âˆž of zolmitriptan dosed orally were increased 1.5, 2, and 3-fold, respectively, compared with normals. Seven out of 27 patients experienced 20 to 80 mm Hg elevations in systolic and/or diastolic blood pressure after a 10 mg dose. Because of the similarity in exposure, zolmitriptan tablets and nasal spray should have similar dosage adjustments and should be administered with caution in subjects with liver disease, generally using doses less than 2.5 mg. Doses lower than 5 mg can only be achieved through the use of an oral formulation [see Dosing and Administration (2.2) and Use in Special Populations (8.6) ]. An in vivo drug interaction study with ZOMIG Nasal Spray indicated that 1 spray (100Î¼L dose) of xylometazoline (0.1% w/v), a decongestant, administered 30 minutes prior to a 5 mg nasal dose of zolmitriptan did not alter the pharmacokinetics of zolmitriptan. The pharmacokinetics of zolmitriptan, as well as its effect on blood pressure, were unaffected by 4 weeks of pre-treatment with oral fluoxetine (20 mg/day). Following one week of administration of 150 mg bid moclobemide, a specific MAO-A inhibitor, there was an increase of about 25% in both Cmax and AUC for zolmitriptan and a 3-fold increase in the Cmax and AUC of the active N-desmethyl metabolite of zolmitriptan [see Contraindications (4) and Warnings and Precautions (5)]. Retrospective analysis of pharmacokinetic data across studies indicated that mean plasma concentrations of zolmitriptan were generally higher in females taking oral contraceptives compared with those not taking oral contraceptives. Mean Cmax and AUC of zolmitriptan were found to be higher by 30% and 50%, respectively, and Tmax was delayed by one-half hour in females taking oral contraceptives. The effect of zolmitriptan on the pharmacokinetics of oral contraceptives has not been studied. Following the administration of cimetidine, the half-life and AUC of a 5 mg dose of zolmitriptan and its active metabolite were approximately doubled [see Drug Interactions (7.4)]. Zolmitriptan was administered to mice and rats at doses up to 400 mg/kg/day. Mice were dosed for 85 weeks (males) and 92 weeks (females); rats were dosed for 101 weeks (males) and 86 weeks (females). There was no evidence of drug-induced tumors in mice at plasma exposures (AUC) up to approximately 700 times that in humans at the maximum recommended human dose (MRHD) of 10 mg/day. In rats, there was an increase in the incidence of thyroid follicular cell hyperplasia and thyroid follicular cell adenomas seen in male rats receiving 400 mg/kg/day. The no-effect dose for tumors in rats (100 mg/kg/day) was associated with a plasma AUC â‰ˆ700 times that in humans at the MRHD. Studies of male and female rats administered zolmitriptan prior to and during mating and up to implantation showed no impairment of fertility at oral doses up to 400 mg/kg/day. The plasma exposure (AUC) at this dose was approximately 3000 times that in humans at the maximum recommended human dose of 10 mg/day. The two hour headache response rates in patients treated with ZOMIG Nasal Spray were statistically significant among patients receiving ZOMIG Nasal Spray compared with placebo. There was a greater percentage of patients with a headache response at 2 hours in the higher dose groups. The headache response efficacy endpoints of the controlled clinical study, analyzed from the first attack data, are shown in Table 2. (N = number of randomized patients treating a migraine attack). The 2 hour headache response wNas the primary end-point. 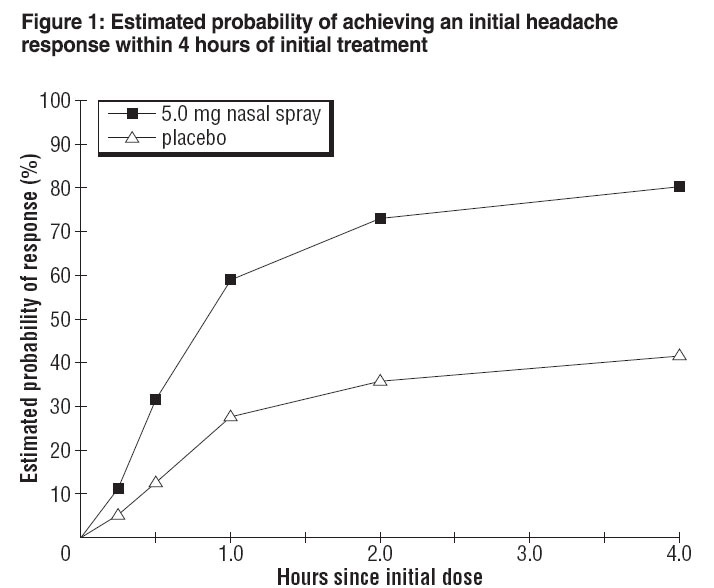 Figure 1 shows the Kaplan-Meier plot of the probability over time of obtaining headache response (moderate or severe headache improving to mild or no pain) following treatment with zolmitriptan nasal spray. The averages displayed are based on a placebo controlled, outpatient trial providing evidence of efficacy. Patients not achieving headache response or taking additional treatment prior to 4 hours were censored to 4 hours. The efficacy of ZOMIG was unaffected by presence of aura; presence of headache upon awakening, relationship to menses; gender, age or weight of the patient; or presence of pre-treatment nausea. 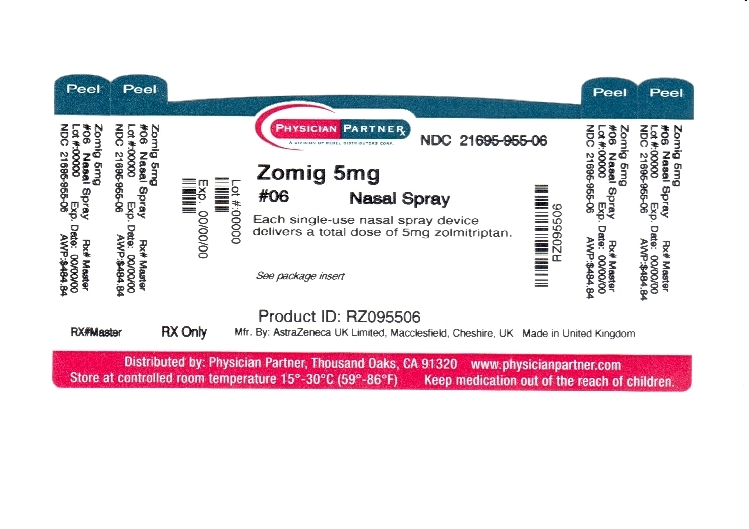 ZOMIG Nasal Spray is supplied as a clear to pale yellow solution of zolmitriptan, buffered to a pH 5.0. Each ZOMIG Nasal Spray device contains 5 mg of zolmitriptan in a 100-Î¼L unit dose aqueous buffered solution containing citric acid, anhydrous, USP, disodium phosphate dodecahydrate USP and purified water USP. 5 mg ZOMIG® Nasal Spray is supplied in boxes of 6 single use nasal spray units. (NDC 21695-955-06). Patients should be informed that ZOMIG may cause serious cardiovascular side effects such as myocardial infarction or stroke, which may result in hospitalization and even death. Although serious cardiovascular events can occur without warning symptoms, patients should be alert for the signs and symptoms of chest pain, shortness of breath, weakness, slurring of speech, and should ask for medical advice when observing any indicative sign or symptoms. Patients should be apprised of the importance of this follow-up [see Warnings and Precautions (5.1, 5.3, 5.4)]. Patients should be cautioned about the risk of serotonin syndrome with the use of ZOMIG or other triptans, particularly during combined use with selective serotonin reuptake inhibitors (SSRIs) or serotonin norepinephrine reuptake inhibitors (SNRIs) [see Warnings and Precautions (5.5)]. ZOMIG should not be used during pregnancy unless the potential benefit justifies the potential risk to the fetus. • Have taken any of the following medicines in the last 24 hours: other â€œtriptansâ€ like almotriptan (AXERT ®), eletriptan (RELPAX ®), frovatriptan (FROVA ®), naratriptan (AMERGE ®), rizatriptan (MAXALT ®), sumatriptan (IMITREX ®), sumatriptan/naproxen (TREXIMET); ergotamines like BELLERGAL-S ®, CAFERGOT ®, ERGOMAR ®, WIGRAINE ®; dihydroergotamine like D.H.E. 45 ® or MIGRANAL ®; or methysergide (SANSERT®). These medications have side effects similar to ZOMIG Nasal Spray. • Have taken monoamine oxidase (MAO) inhibitors such as phenelzine sulfate (NARDIL ®) or tranylcypromine sulfate (PARNATE ®) for depression or other conditions, or if it has been less than 2 weeks since you stopped taking a MAO inhibitor. • Are allergic to ZOMIG Nasal Spray or any of its ingredients. The active ingredient is zolmitriptan. The inactive ingredients are listed at the end of this leaflet. Tell your doctor if you are taking selective serotonin reuptake inhibitors (SSRIs) or serotonin norepinephrine reuptake inhibitors (SNRIs), two types of drugs for depression or other disorders. Common SSRIs are CELEXA® (citalopram HBr), LEXAPRO® (escitalopram oxalate), PAXIL® (paroxetine), PROZAC® (fluoxetine), SYMBYAX® (olanzapine/fluoxetine), ZOLOFT® (sertraline), SARAFEM® (fluoxetine) and LUVOX® (fluvoxamine). Common SNRIs are CYMBALTA® (duloxetine) and EFFEXOR® (venlafaxine). Your doctor will decide if you can take ZOMIG Nasal Spray with your other medicines. The ZOMIG Nasal Spray device is a blue colored plastic sprayer device with a gray protection cap, labeled to indicate the dose. For adults, the usual dose is a single nasal spray taken into one nostril. If your headache comes back after your first dose, you may take a second dose anytime after 2 hours of taking the first dose. For any attack where the first dose didnâ€™t work, do not take a second dose without talking with your doctor. Do not take more than a total of 10 mg of ZOMIG (tablets or spray combined) in any 24-hour period. If you take too much medicine, contact your doctor, hospital emergency department, or poison control center right away. A. 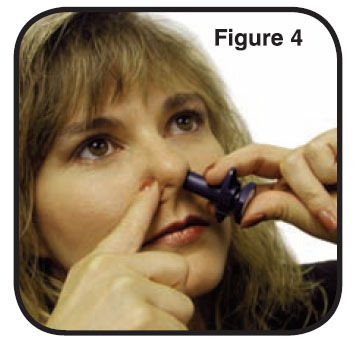 The Tip: This is the part that you put into your nostril. The medicine comes out of a tiny hole in the top. B. 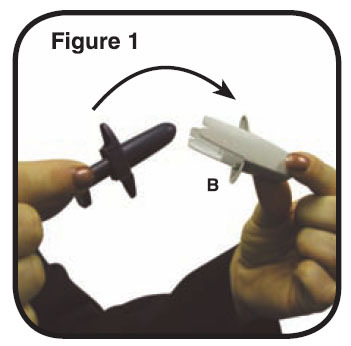 The Protective Cap: This covers the tip to protect it. Do not remove the protective cap until just before you are ready to take your ZOMIG Nasal Spray. C. The Finger-grip: This is the part that you hold when you use the sprayer. 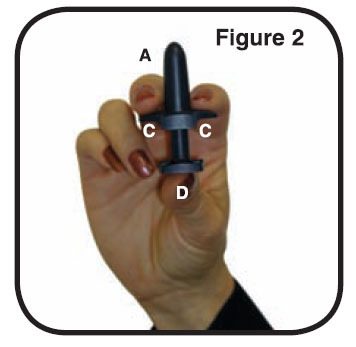 D. The Plunger: This is the part that you press when you put the tip into your nostril. This sprayer works only once. Some people may have a reaction called serotonin syndrome, which can be life-threatening, when they use ZOMIG. In particular, this reaction may occur when they use ZOMIG together with certain types of antidepressants known as SSRIs or SNRIs. Symptoms may include mental changes (hallucinations, agitation, coma), fast heartbeat, changes in blood pressure, high body temperature or sweating, tight muscles, trouble walking, nausea, vomiting, and diarrhea. Call your doctor immediately if you have any of these symptoms after taking ZOMIG. This leaflet summarizes the most important information about ZOMIG Nasal Spray. If you would like more information about ZOMIG Nasal Spray, talk to your doctor. You can ask your doctor or pharmacist for information on ZOMIG Nasal Spray that is written for health professionals. You can also call 1-800-236-9933 or visit our web site at www.ZOMIG.com.